Just finished the Wrapped Stitches Baby Hat for straight needles. Thank you for sharing this lovely, easy, pattern. I am wondering if there maybe an error in the instructions. The decrease seems to be written as for circular needles. Should there be some purl rows in there? Thank you for letting me know. You are correct and I’ve changed it now. I had neglected to change the even rows in the crown when I converted the pattern. 4mm is a size 6. I say size 6 (4mm). 4mm knitting needles are equivalent to Old UK Size 8, but US Size 6. Love your simple patterns for newborn baby hats. 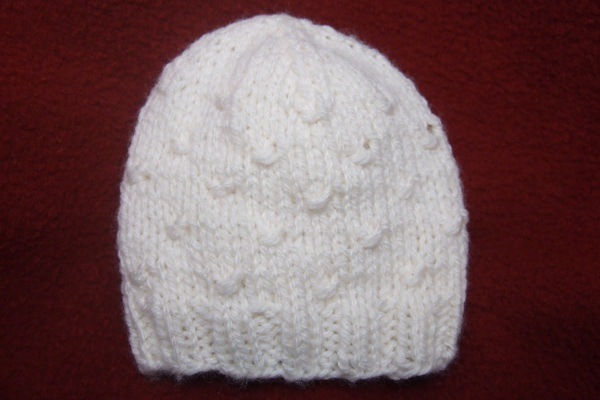 Want to knit a simple hat but your wool patterns are DK and I need a 4ply pattern as have wool already. Can you tell me how to adjust your pattern to the right tension. Many thanks, Janice. I think I may have gone wrong on the first decrease round? How many stitches should I have after row 1 of decrease round for newborn size? The newborn size has 6 sets of decreases, so decreases 12 stitches each decrease round. After the first set of decreases you should have 61 stitches. Just made this adorable hat, in blue, for my nephew-to-be!!!! Super happy with the outcome. Thank you so much for this lovely pattern! Definitely love the w2s in this design! Would this and your other patterns work out well in worsted weight yarn? I don’t have DK weigh yarn. I’m looking for preemie or newborn hats to knit for a charity. I have size 6 straight needles. Do you usually use size 6 with worsted? If I try to use size 6 with worsted it comes out too tight. I usually use at least a 7 but usually 8. Hi, when I am completing the main body of the hat row 7 the whole row ends with w2s but then there is nothing left on the left needle when you slip over to the right at the beginning of this step which makes it hard to follow the steps for w2s. I tried my best slipping it back and forth between the needles and then it ends up with a step in the end of the knitting. There should be a knit after that last w2s. How many stitches did you begin with? Hey! I’ve been looking for a good pattern that can be done on two straight needles. I want to use 6mm needles, so I’m going to decrease the number of CO stitches and try to figure out how to do the decrease!!! I just made this hat for my 18 month old grandson and it came out great! A very easy pattern to follow that can be done in a few hours! Thank you so much!!!!! I am confused about the ssk direction. The directions state “slip one knitwise, slip one knitwise, insert left needle into front of both slipped stitches and knit. How does one knit when the left needle appears to be in the way? 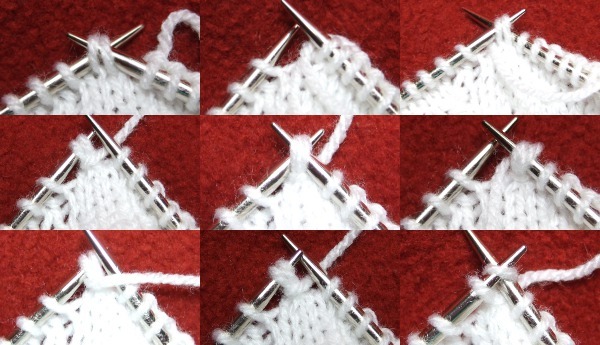 To make a normal knit stitch, while the stitch is on the left needle, you insert the right needle behind the left one. If you look at the needles before you knit the stitch, the left needle crosses over the top of the right one. For the ssk, you move unknit stitches knitwise to the right needle. Passing them knitwise changes the direction of the loops to create the effect wanted. Now when you insert the left needle through the front of the stitches, the right needle is in the back just like in a regular knit stitch. The same thing could be achieved by passing the two stitches knitwise to rotate the loops, passing them both back to the left needle purlwise which does not rotate the loops and then doing a regular k2tog. But if you look at the needle position during the k2tog, it’s exactly the same as the position for the ssk, so these extra steps aren’t necessary. I hope that explanation makes sense. Hi I would like to knit the hat in adult size with 4mm needles. How much stitches do you think I should cast on? 121 for a S/M adult size or 133 for a L adult size. Great pattern. I would like to make this hat as a gift for a baby due to be born in May and would like the child to be able to wear the hat during Fall and Winter of 2017 when he/she would be 5-12 months old. Should I knit it in a 6 month size or 12 month size? Thanks very much for your help. The 6 month size is stretchy and will last a bit for size. The 12-month size would probably be too big for most of that period of time. Loved this pattern! One question: the cast on stitches for straight needles for 12 month old is 84, but is 96 in circular? I did 96 and the hat came out as if it would fit a 2 year old. I used worsted and a smaller needed (US 5). The straight needle and circular cast-ons per size only different by an additional stitch for the straight needle version to allow for a seam. Even using smaller needles with worsted won’t fully compensate for the larger size. I’d recommend also casting on for one size smaller. is there a baby cardigan pattern the same as this? I didn’t create a cardigan pattern for it. If you have a pattern for a plain baby cardigan that you like you could add wrapped stitches to it to make it coordinate.